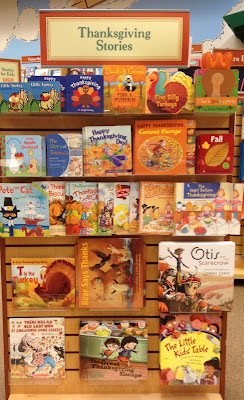 Well, I did my annual visit to Barnes and Noble to see what they had on the Thanksgiving shelf. 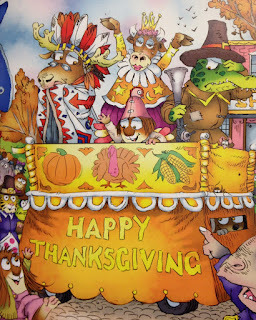 Never a pleasant outing, I hasten to add, but one that I do each year, hoping that there won't be any new books where characters do a Thanksgiving reenactment or play of some kind. Now he is going to have a Thanksgiving he'll never forget! From the school play to a surprise dinner for all of Critterville, celebrate along with Little Critter and his family as they give thanks this holiday. 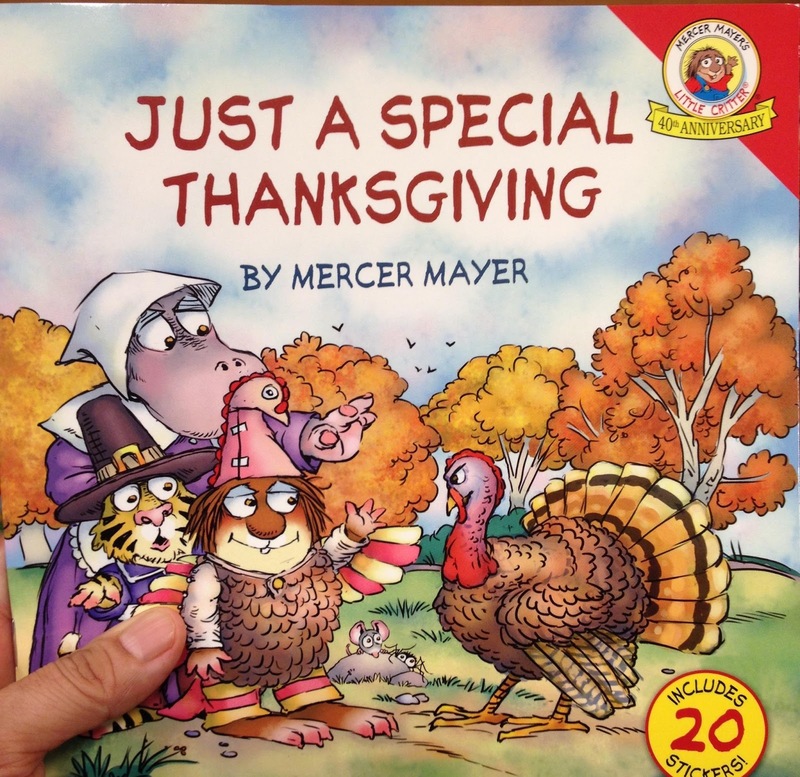 Starring Mercer Mayer's classic, loveable character, this brand-new 8x8 storybook is perfect for story time and includes a sheet of stickers! 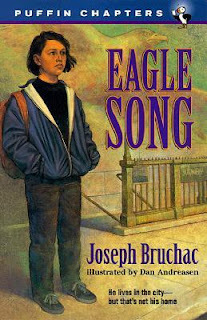 If you just look at the cover, you don't see anybody in feathers. You might think they're doing a "just be thankful" kind of story, but nope. 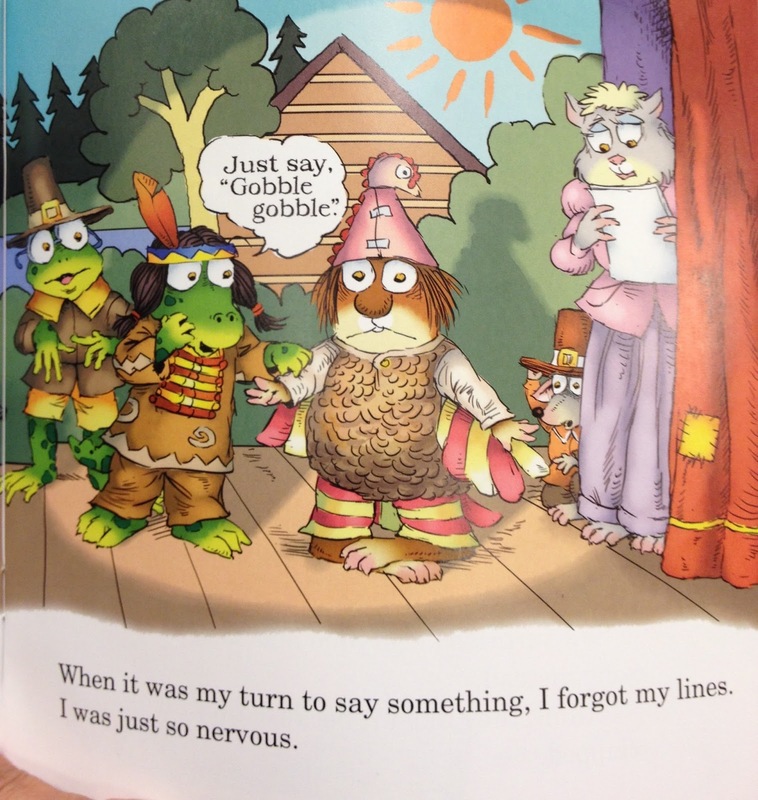 One of the first pages shows Critter and his buddies at school, getting ready for the play. Pretty awful, start to finish, and I gotta say, too, that I'm disappointed. 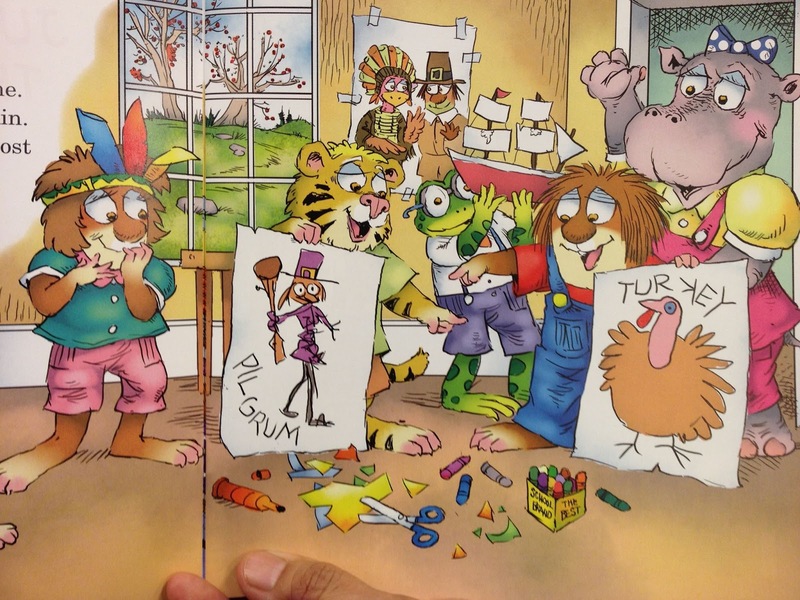 Though I haven't read a Critter book in a long long time, I do have fond memories of them. I dove into research spaces and see that a colleague, Michelle Abate, has an article about Critter in a 2015 issue of Bookbird. I'm going to see if I can get a copy of it. Course, her article won't have anything about Just a Special Thanksgiving in it, but I'm interested in a researcher's perspective on the series. I didn't look at each book. 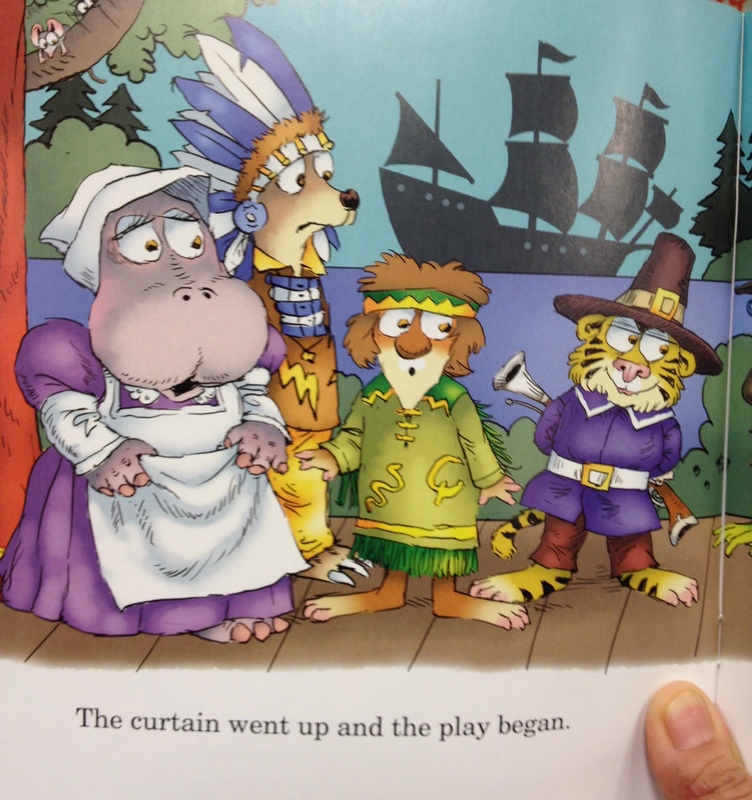 Some are familiar from years past, like Pete the Cat in which Pete is shown as Squanto. 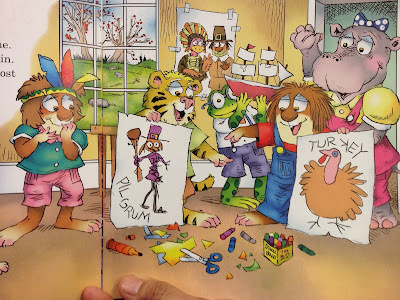 And there's some messed up images in the Curious George book, too. And Pinkalicious. If I was buying? I'd get that one on the bottom row: The Great Thanksgiving Escape by Mark Fearing. It is hilarious. That page where the kids run into "the great wall of butts" is priceless! I know my sister's grandson would love that part. Those alternative achievements? The importance of relationships. Reading her article makes me think about the relationships the publishing industry has with Native people--indeed--with the many peoples who have been misrepresented or omitted entirely from the books they publish. From my point of view, Just A Special Thanksgiving is a failure that Mercer Mayer and his publisher can set aside in favor of the relationships they want to build with Native people and all people who are saying 'stop giving us this story' of Thanksgiving!